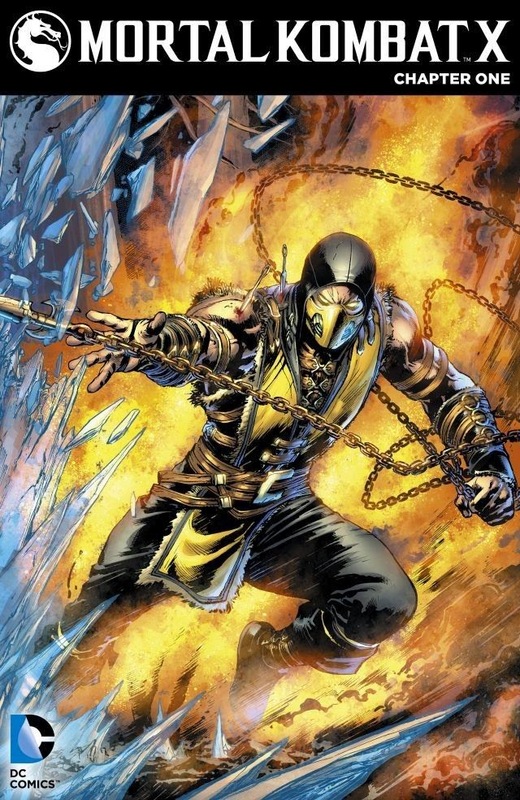 Before we get into this issue I just want to say that Mortal Kombat was huge for me when I was a kid and I'm sure for a lot of you out there it was the same. So here we are twenty years later and the tenth game is about to come out and to lead us into this new game we have this digital first comic to guide us to where the story will go. Now for me I was heavy into the games up until after Mortal Kombat 4 and then I did play the hell out of 2011's Mortal Kombat reboot so I've at least got that going for me when I go through this book. As you may know from playing the last game, time travel has gone and changed everything you thought you knew about the Mortal Kombat story and when we left off I remember Raiden, Johnny Cage and Sonja Blade being the only survivors and what looked like us about to get into a new type of Mortal Kombat 4. Here's the thing though, from what I've read it seems that Mortal Kombat X takes place twenty five years after the events of the last Mortal Kombat game, so we've got a lot of time to catch up on here............ I hope I know what the hell I'm talking about in these reviews. Let's check it out. Our story begins in what the story is calling "Some Time Ago" which could really mean anything if we're already before the twenty-five year time gap between the two games, so I guess you could go with anything here. Kenshi is traveling with his son across the Himalayan wilderness trying to escape the Red Dragon clan. Now there's some good news and some bad news here. The bad news is that the Red Dragons caught up with Kenshi but the good news is that he led them right through Shirai Ryu territory. Don't know what that means? Well, it's apparently Scorpion's clan and he doesn't tolerate Red Dragons trespassing. Oh yeah, a whole lot of spears going through people here. Okay so the Red Dragons are all killed and when Scorpion leads Kenshi and his son back to the Shirai Rya Temple we find out that Kenshi's baby mama got in contact with him while he was undercover trying to take down the Red Dragon clan's leader Daegon and when she told him that he had a son, he made his way to her. The only problem is the Red Dragon clan got to her first and after finding his son in hiding, he made his way back to where we are now. So now that we're all squared away with why Kenshi has a son........... if that's a thing you were wondering, we have Kenshi starting his quest up again and I'm left wondering when the hell did Scorpion become human again? There's a throwaway line about Hanzo conquering the Scorpion years ago but that's the more interesting story to me. 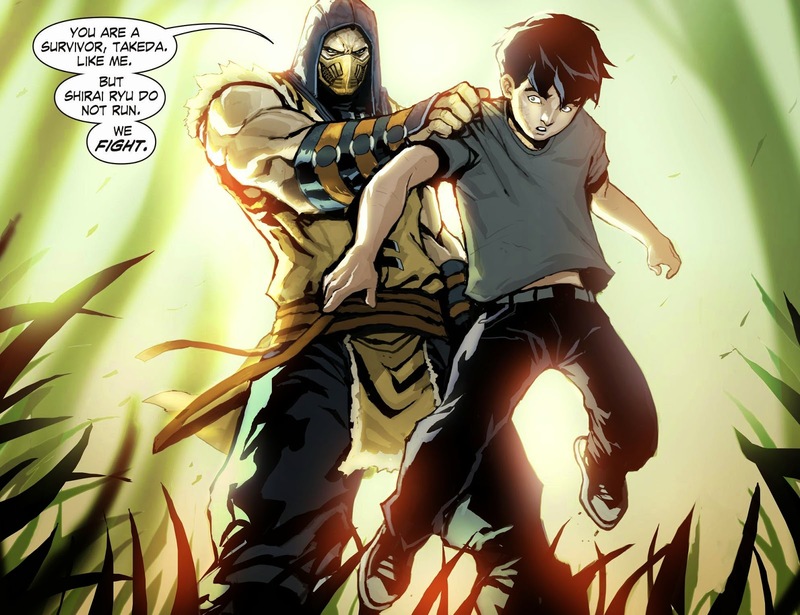 So we leave this bit of the story with Kenshi leaving and what looks like Scorpion considering training the young boy. 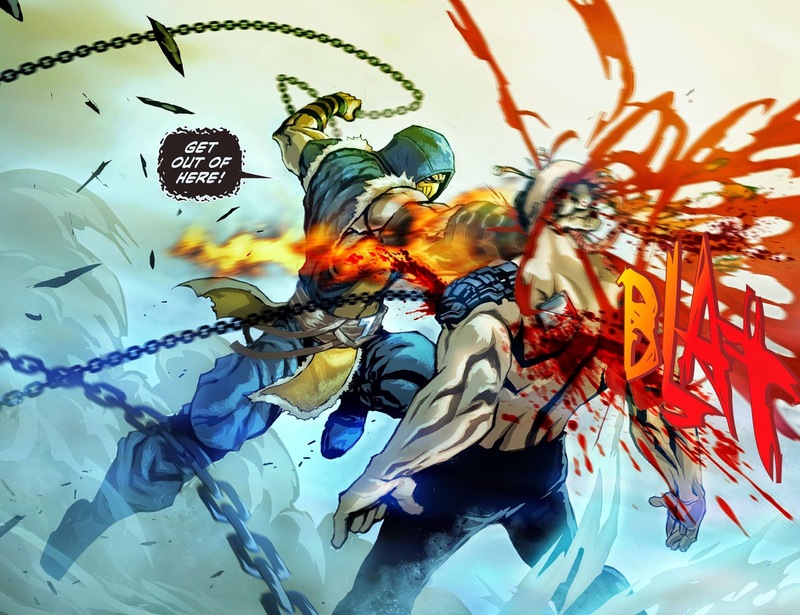 In the end, we head over to the Red Dragon Temple where Sub Zero is trying to break in and steal the Kamidogu Dagger for Raiden but when he enters he's slashed across the eye with the blade by a waiting Kano and as we leave this issue we see Sub Zero screaming "The Dagger...It's Cursed.."
That's it for this issue of Mortal Kombat X and man I couldn't be more confused if I hadn't played any of the games at all. I know there will be uber fans of this that will probably get what's going on more than me but man does that alienate a whole lot of fans out there that might want to read this. Now in the last Mortal Kombat game, I'm pretty sure that the original Sub Zero died and became Noob Saibot and the second Sub Zero became a cyborg.......... So I have no idea who this other Sub Zero here is and hell I don't even know what timeline we're talking about here. Is this during the last game, leading up to the new game or just something else? I don't know, but I really hope that fans of Mortal Kombat will be able to get behind this because as of right now I'm lost and I hate being lost. With that though, the art by Dexter Soy is fantastic and I really loved everything that I saw here even if I couldn't completely understand it. Hopefully, the story becomes more user-friendly and I can get behind everything in this book. For a first issue, they really expect you to know a lot going in and that's a big hindrance to the book right from the get-go. 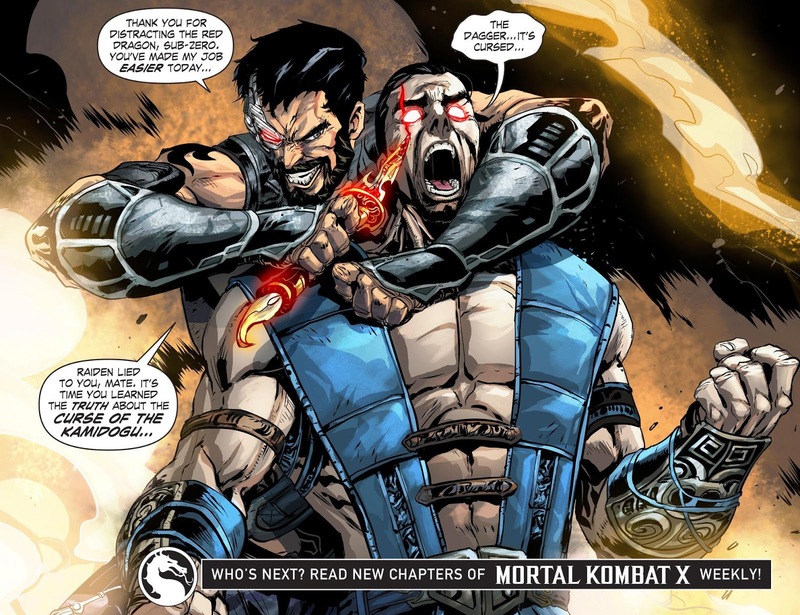 I thought I knew enough of the Mortal Kombat story going into this but I found myself in the category of "noob" right away as I was thrust right into a story that I knew nothing about and with the digital-first titles being so short, I still know nothing about what was really going on here or how it would lead to the upcoming game. Right now I can only recommend this to people that are deep into the MK mythos because for anyone else, it really isn't user-friendly.